A big reason why the rise of indie games has been so celebrated is because of how staunchly they tend to represent the hits of old types of gaming often dismissed by today’s larger publishers (many of which, it should be noted, helped give rise to such games in the first place) as being too difficult or otherwise inaccessible for general public consumption. Occasionally, an indie game will come along that takes that idea to its logical conclusion, not only featuring some old-school difficulty, but building the entire game around the concept of trial-and-error-driven, ballbreaking difficulty that wasn’t even the order of the day back in the 1980s. Such is the case with Nicalis Games’ 1001 Spikes. 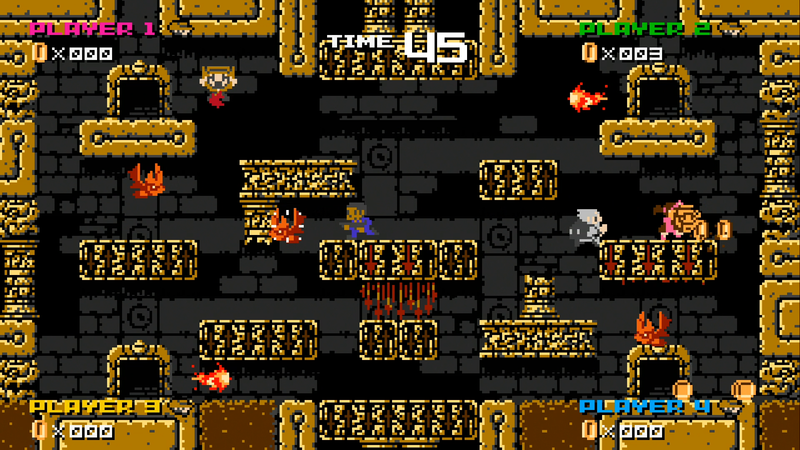 1001 Spikes is an 8-bit-esque 2D platformer that takes its influences from Tecmo’s late-80s output such as Solomon’s Key, Mighty Bomb Jack, and Ninja Gaiden in its approach to gameplay, narrative, and particularly its soundtrack. For those who aren’t familiar with that style, or weren’t born in time to experience it, just know that’s a very good thing. The main quest follows Aban Hawkins, whose estranged adventurer father has gone missing and is presumed dead. He leaves behind a note and map for Aban that leads him to an untouched ruin in South America. To Aban, the opportunity to get the last laugh over his famous father is even more enticing than the opportunity to pick more than enough treasure in the ruins to make up the inheritance that was all left to his sister. What he finds, however, is a meticulously-crafted world of quick and sometimes repeated death, straight out of anyone’s worst 8-bit nightmares. 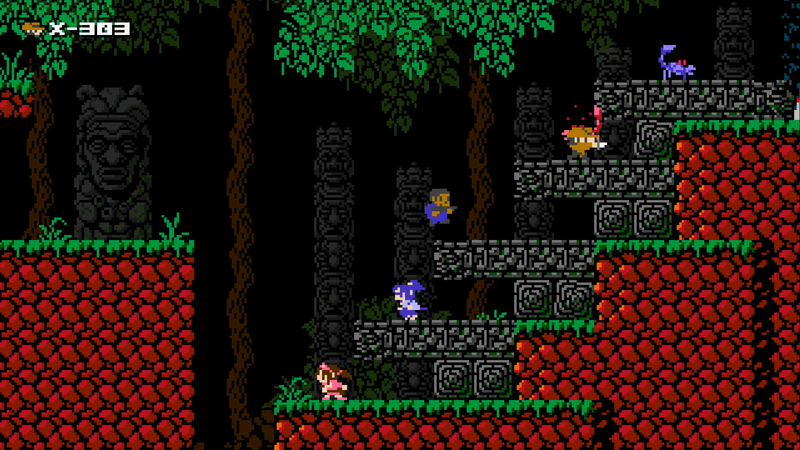 To compensate, Aban has 1001 lives with which to make it through the ruins, allowing him all the trial and error (so very much error) necessary to solve some of the most vicious, if awesome, level design this side of the NES. 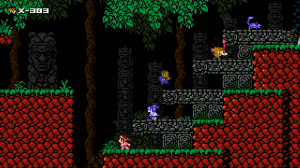 Nigh-invisible death traps, challenging enemies, and pixel-perfect jumps are littered between Aban and his bounty, just like we did it in the 80s. That isn’t to call the level design perfect, mind you. 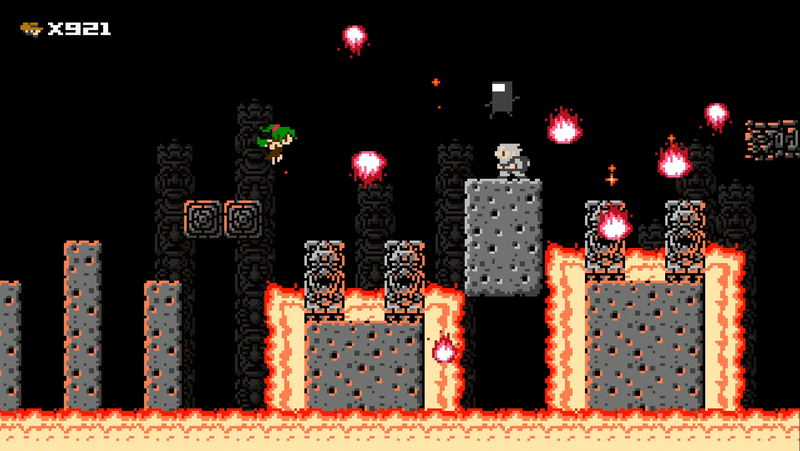 Even by those brutal 8-bit standards, some stages can end up too busy for their own good, and oftentimes you find yourself covering most of a given stage only to get screwed over by the one step Nicalis didn’t have to take. For example, you may get picked off at the exit by a motion trap that everything you’ve navigated up to that point made you forget about, or falling rocks that are out of synch with the rest of the stage as a whole. 1001 Spikes is no one-trick pony. 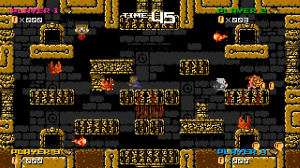 In addition to the level-skip option, which prevents you from getting stuck on a stage that’s just too difficult for your skillset (or in other cases, where you can’t figure out exactly what it is the game is asking you to do in the first place), there are unlockable arcade modes to add some variety to the mix, as well as a whole mess of unlockable characters with varying abilities to change up your experience as you play on. This adds considerable replay value to a game that, normally, would only be good for a single playthrough. Even in today’s indie-driven environment, legitimate throwbacks like 1001 Spikes don’t come along that often, and should be embraced when they do. Even games that are considered difficult by today’s standards — and within that, even those that are rightly considered as such — bring a far different brand of difficulty than what you’ll get out of 1001 Spikes. This is the kind of game that develops your all-around gaming skills, and gives you the tools you need to improve your gameplay across the board. That’s rare in this day and age.